LBI2SXM, I enjoy cooking, probably more than actually eating. I just made Panna Cotta this afternoon for the second time since returning from Italy! It's an easy dessert! Next time I'll take step by step photos! Dissolve 1 envelope unflavored gelatin in 2 tbls cold water in small sauce pan, bring slowly to a simmer then remove from heat. Put 2 cups heavy cream in sauce pan, add 1/3 cup sugar, 1-1/2 teaspoons vanilla extract, pinch of salt and zest of 1/2 orange. Bring just to a boil then remove from heat, add gelatin and whisk together. Pour mixture into small glassware, makes 4 nice servings. Let cool to room temp, then in the fridge for at least 4-6 hours to set. Setting overnight is good, just cover with plastic wrap to keep a skin from forming. We are topping it with fresh raspberries and strawberries tonight! Last edited by Carol_Hill; 03/13/2018 09:18 AM. Hey Beerman, that sounds great! I always have wanted to try to make that but never did. Watched Lidia make it on her TV show. How did it turn out? Looks beautiful, Beerman! But are those FLORIDA strawberries?? We just bought a half flat of Florida strawberries over the weekend, shared some with a friend, and made some strawberries with balsamic and black pepper (Ina Garten's recipe) and some strawberry ice cream in my mixer attachment. Both were lovely, although I confess, no pictures! Yep, Florida strawberries! and raspberries from Mexico. 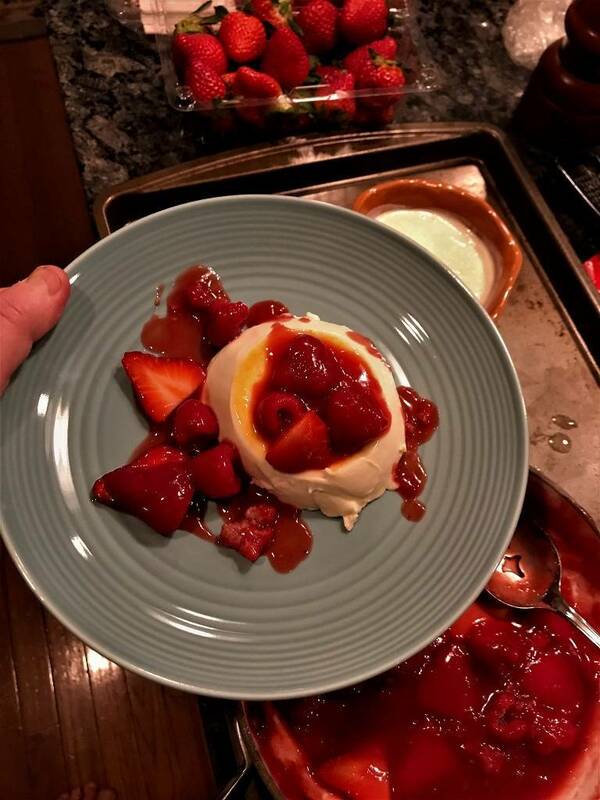 We were pressed for time, I let the panna cotta cool on the counter for 20 minutes, then into the freezer for 20 minutes, then fridge for 2-1/2 hours, back to freezer for 20, back to fridge for 30 minutes and it set pretty firm. The last and first time I made it I put in fridge for 8 hours, set a little firmer than this time, both were great. The sauce...juice of the orange I zested, couple tablespoons of water, cup of raspberries, heaping tablespoon sugar and smashed the raspberries while simmering. Put that in a blender and strained, then added whole fruit. Awesome Beerman. Looks delish! Will definitely try this very soon. My only problem is I have no access to fresh strawberries. Where do you live, that you can't get fresh strawberries? I know we live in Florida, but here we can get fresh strawberries year round. A lot of them come from California though. I've made great sauces with frozen berries! I used the orange because we had one, I really like using lemon! In the winter strawberries are from South America or at best California. But they are dry, no taste, and I really don't like to use them. If push comes to shove, I will use the frozen, they are not too bad. "Dissolve 1 envelope unflavored gelatin in 2 tbls cold water in small sauce pan, bring slowly to a simmer then remove from heat." 2 tablespoons cold water! use a very small sauce pan, sprinkle gelatin in water, it starts to dissolve, heat gently for a minute until it thickens. Seems so pretty and yummy too!